It was cold, it was rainy, and it was muddy last Saturday. But we knew that going in. We set up around 7 a.m. and it was pretty much just our crew under the tent until noon. Soon after that, the rain set in, but fans started to arrive in greater numbers under our tent and all over the course. All afternoon, it was a nice trickle of newcomers, and the crowd under the tent never wavered as game time approached. Jamey Johnson had prepared some excellent pork, Ashley Parker had prepared some beans and slaw and slowly but surely, the keg of home brew Jack Clark provided and the cases of Lost Forty beer had disappeared. People were ready. The game was nigh. Walking in, it felt like a Top 20 battle. Hog fans were eager to get an SEC win, and with the porous Ole Miss defense, we thought we just might. But, it was not to be. Yet again the Hogs didn’t have enough in the tank to pull out a win in the 4th quarter. As we pulled into the driveway, we took stock. It had been a solid 16 hours on our feet, the Hogs had lost, and we were exhausted. Still, it had been a good day. Plenty of old friends had been seen, lots of stories of previous wet games at War Memorial were shared, and new memories were made. It was the essence of a full day and a great tailgate. It sometimes seems that it is the challenging conditions and the ability to overcome the elements that stick with you as some of the more memorable tailgates. We all remember the cold, wet, windy games more than the stifling hot ones. Those you just want to survive. As Tulsa comes to town this week for an 11 a.m. kickoff, the weather appears to be the exact opposite of last week. We should see sunny skies and a cool morning warming into a nice 63-degree afternoon. We will do another breakfast tailgate, but we are examining the possibility of staying late for a post-Vanderbilt game tailgate the following week. We learned that the Vandy game will be yet another 11 a.m. kickoff, and you can only eat so many eggs. There is also concern that as the morning games pile up, the crowd will continue to dwindle. Perhaps later festivities will entice a larger crowd. Ole Miss has perfected the post-game tailgate scene, as we have noticed on some of our early games in the Grove. If the weather cooperates, it should be something to look forward to. But enough about Tulsa and Vandy, let’s talk Kentucky. The Hogs don’t play the Wildcats in 2018 but they go to Lexington in 2019. It has been 10 years and 4 coaches since the football Razorbacks last visited the Bluegrass State, and it was one of our better trips. I bring this up now because the game is just a year out, so hotels will start opening up their reservation books. 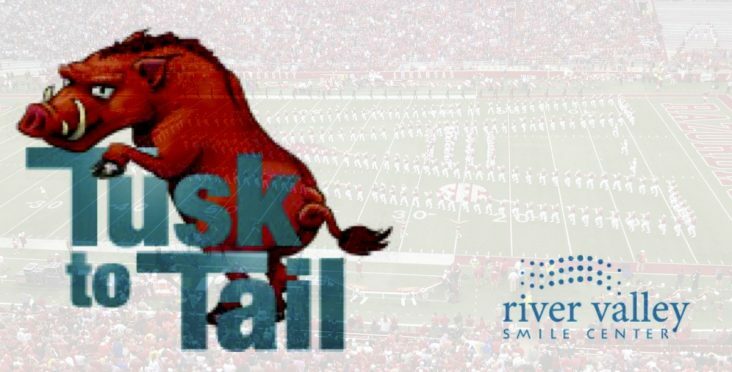 Tusk to Tail will hit Lexington on Wednesday, Oct. 9, and spend four nights. Thursday will be reserved for some bourbon distillery tours, Friday for the Fall horse racing meet at Keeneland, and then of course, tailgating and football on Saturday. I encourage you to look into this trip for two reasons. It is fun, and the Hogs are not scheduled to return for another 10 years. If you are trying to check off the SEC stadium list, it is a must-do trip. Remember the streets will be cut off at 7 a.m. this Saturday, so don’t be late. Go Hogs, Beat the Golden Hurricane!